Always a favorite time in Smicksburg as the fall foliage adds a special beauty to all the festivities and entertainment this fabulous weekend. 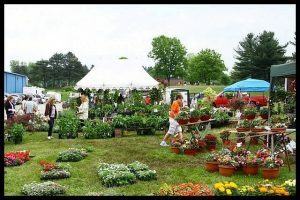 Fair in July that offers agricultural and horticulture displays along with entertainment and kids activities. Spring has sprung in Smicksburg! Visit the area businesses brimming with new merchandise.Enjoy the fresh look of this year's newest country fashion. Enjoy a weekend of food, entertainment, children's activities and fun. This event typically takes place in the month of September. For more information or details about this event visit our calendar of events listing. Agricultural displays and competitions, animal and craft exhibits, rides and entertainment throughout the week. This event typically takes place in the month of September. Week-long event offers local farmers, 4H members and others to show their livestock, crafts, baked goods in numerous competitions. Other events including tractor pulls, demolition derbies, entertainment, carnival fun and food. This event typically takes place in the month of August. For more information and details please visit our calendar of events listing. Here is where you want to begin your garden for the year. Various nurseries provide a wide selection of annuals, perennials and shrubs for you to choose from. Craft vendors provide ornamentation with garden related or handcrafted items. Food vendors provide a variety of tasty selections. This Indiana Garden Club event assists in funding our annual scholarships for local students. For more information on our scholarships, May Mart and additional club details, please visit our website. Always the week of Labor Day. This community fair features an array of events including tractor pulls, ATV racing, demolition derby, horse judging as well as carnival rides, food, entertainment and agricultural displays. It's all about apples-apple butter and apple cider making demonstrations and locally grown apples for sale. 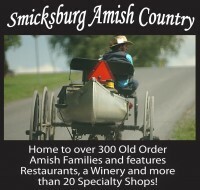 Visit over 20 specialty shops selling apple pie, apple dumplings, apple fudge, apple cider and apple butter. This event typically takes place in the month of September. The open house features refreshments, wine tasting, Christmas baked goods and fresh pies. Visit the many unique shops and restaurants in the area. Downtown Smicksburg Christmas Tree Light Up will be held. Santa will be arriving with a treat bag for the children. This event typically takes place in the month of November. For more information and details please visit our calendar of events listing. The 3 day festival includes a quilt show, duck race, flag retirement ceremony, parade, crafts, food vendors, live entertainment and fireworks. This event typically takes place in the month of June. For more information or details visit our calendar of events listing. Tree decorating, visits with Santa and his Elves, entertainment and refreshments to start holiday season. This event typically takes place in the month of December. For more information or details visit our calendar of events listing. Come enjoy the St. Patrick's day parade with all your friends and family. This event typically takes place in the month of March. For more details and information please visit our calendar of events listing. 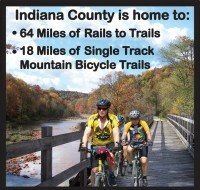 Indiana County Day - Christmas in July Enjoy Christmas in July! See Santa and experience some wonderful holiday cheer. For more information or details please visit our calendar of events listing. An Annual Fall Coin Show, sponsored by the Indiana Coin Club. Thirty six tables are manned by coin dealers from Pennsylvania, New York, Ohio and West Virginia. This event typically takes place in the month of September. For more information or details about this event visit our calendar of events listing. Come cut your family's Christmas tree and stop for a cup of hot chocolate and don't forget to stop at the gift shop. This event typically runs from Thanksgiving to middle of December. For more information or details visit our calendar of events listing. The Indiana-Armstrong Builders Home Show is March 22, 23 & 24 2019 at the Kovalchick Convention and Athletic Complex. For more information and details visit our calendar of events listing. The 2019 Chamber Business Expo is set for Saturday, January 26 from 10:00 AM - 3:00 PM at the Indiana Mall. It promises to be an exciting event filled with great business-to-business and business-to-new customer interactions. We're adding some fresh entertainment that should fill the mall with people anxious to learn about your business. The 2019 event will be held June 8-9. 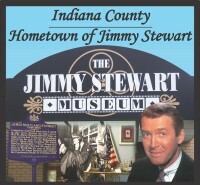 Join us for the second annual Jimmy Stewart Airshow held at the Indiana County Airport brought to you by David Schultz Airshows and the Indiana County CEO and its affiliates! This two-day event will feature daring and sensational aerobatics performances! Experience history with unique and rare aircraft and classic cars on display! Listen to stories from incredible historians! Children 12 and under can enjoy interactive children's areas along with free admission! Enjoy a bite to eat between a full schedule of events at our many food vendors! Grab your tickets now! Kids 12 and under free! Ticket good for one day only, 8am to 5pm. Aerobatics start each day at noon. Tickets will also be sold at the gate during the event. Sorry, no refunds. An annual event held in downtown Blairsville to start off the holiday season. Watch the parade and see Santa arrive. This event typically takes place in the month of December. For more information or details please visit our calendar of events listing. Craft Bazaar, Parade, Bonfire and visit with Santa at the Homer City Fire Hall. This event typically takes place in the month of December. For more information or details please visit our calendar of events listing. In the fall, the potters of Indiana County clean up their studios, wash the clay off their hands, and proudly display their work, and invite the public to drive the scenic back roads of Western PA on this self-guided Potter's Tour. The tour is held the third weekend in October every year.This time of year is often peak for the fall colors making the drive in the country a photographic trip. For more information click here. The annual spring coin show, sponsored by the Indiana Coin Club. Thirty six tables are manned by coin dealers from Pennsylvania, New York, Ohio and West Virginia. This event typically takes place in the month of March. For more information or details please visit our calendar of events listing. The Hoodlebug Festival takes place September 8, 2019. Take part in this local community festival featuring parade, ethnic food booths, variety of cultural music entertainment, artists and crafters, vendors, game booths and ever popular duck race. In addition the Indiana Road Runners Club hosts a 5K Run and Fun Walk in the early evening. The Taste & Tour is a walking tour of some of Indiana's favorite downtown restaurants and those located outside of downtown can be found on N. 7th Street for the evening. This event typically takes place in the month of July. For more information or details please visit our calendar of events listing. Clymer Light-Up Night usually takes place the Friday after Thanksgiving. Following the tree lighting, Santa will arrive on the Fire Truck with treats for all the children. For more information or details visit our calendar of events listing. Graduation will take place. This event typically takes place in the month of May. For more information or details please visit our calendar of events listing. April 23 - 28, 2019 are the dates for this event. For more information or details about this event visit our calendar of events listing. July 27, 2019 is the date for the Summerfest Celebration. For more information or details visit our calendar of events listing. This is an annual event, which includes a parade, game and homecoming announcement. This event typically takes place in the month of October. For more information or details please visit our calendar of events listing. Visit each of the participating shops and sample the delicious treats! Many of the Smicksburg shops will have a different variety of cookie to sample. This event typically takes place in the month of November. For more information and details please visit our calendar of events listing. The Evergreen Garden Club invites you to tinsel time. Christmas Treasures is held at the Rustic Lodge. Boutique shopping, delicious luncheon, holiday designs, entertainment, Santa's surprise, raffles and door prizes. Purchase tickets in advance from Evergreen Garden Club This event typically takes place in the month of December. For more information or details please visit our calendar of events listing. The Delaney Chevrolet Westsylvania Jazz & Blues Festival takes place Saturday May 25, 2019. Memorial Day weekend in Indiana, Pennsylvania at the IRMC Park. The one-day, free jazz and blues festival features a lineup that includes nationally and internationally known musicians, regional acts, and student musicians playing in a classic American small town. Annual car show held at the Marion Center Community Park in Marion Center. Food, door prizes, entertainment and a lot of fun. This event typically takes place in the month of September. For more information or details about this event visit our calendar of events listing. Come to Punxsutawney for some mid-winter fun with world famous prognosticator Punxsutawney Phil! Don't miss the hayride town tours, kids' craft corner, annual chili and wing cook off all leading to the wee hours of the morning when Phil makes his forecast. This event typically takes place in February. For more information or details about this event please visit our calendar of events listing. The 2019 Knotweed Festival is August 10. Reeger's Farm, located off Parkwood Road in Shelocta, is hosting a pumpkin festival. Activities include hayrides, barnyard animals, corn maze, children's activities & great food! Cash only. No pets please. ATM available.